Cats - they rule the internet! You can't open your internet browser of Facebook feed without seeing a cute fluffy kitty or a hilarious Grumpy Cat meme. Just the other night, Grumpy Cat made an appearance on American Idol. No doubt that cats will soon take over the world, if they haven't done so already. Today, I have a fun infographic to share with lots of interesting facts about cats. What kind of cats like to travel? 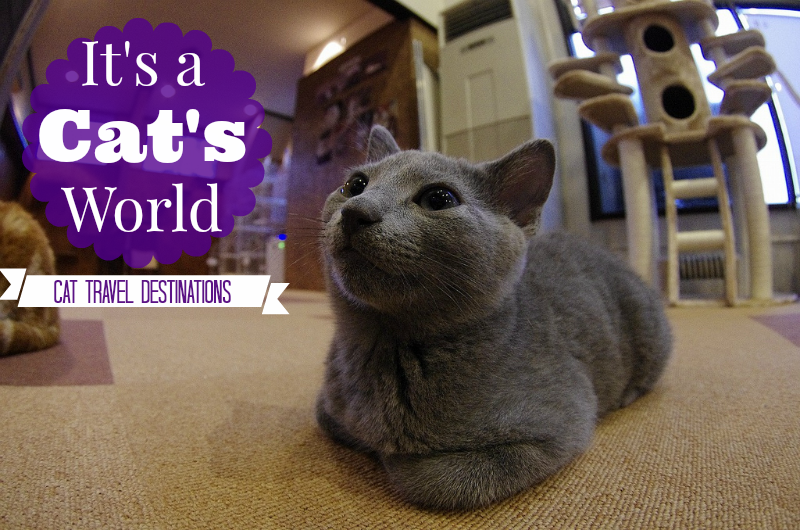 What are the most cat friendly destinations in the world? All of this information and more is shared on this awesome cat infographic. No surprise to see Japan on here a few times. Cat cafes are becoming more popular here in the US, but in Japan you can easily enjoy a cup of coffee while surrounded by lots of furry felines. Definitely a place I'd like to visit if I ever get the chance to travel to Japan some day. Actually, while browsing on Flickr I found that most of the cat cafes in Japan look more like awesome cat playgrounds where you can go pet cats and less like an actual cafe. But, Americans also love their cats. There are an estimated 75 million pet cats in the United States, which makes it the country with the most cats in the world. Take a look at some of the fun cat facts on "The World According to Cats" infographic and let us know your faves! What places would you like to visit? Wow that is a lot of cats and some novel ways to amuse us and them. I think most cat owners would agree that cats do rule the world. Have a fabulous Friday. Oh dogs are 'in' too Misaki! They needed to include Rescue Breed on there! we like de stats frum de countreez who act shoo a lee care for de kittehz...we haz hurd oh Japan's Cat island.....awesum !! I had no idea that there were that many breeds of cats! My cat classification is pretty limited: Siamese, gray, black, white, orange and multiple color combinations. Haha! You sound exactly like me just a few years ago. It wasn't until recently that I learned a few more breeds of cats. I like just plain old domestic shorthairs, which is fancy talk for your everyday average cat. M would love it if we had a cat cafe around here. She'd frequent it every day even tho she has me at home. She just can't get enough of cats! I need more cats in my life! I don't know, but that would be pretty awesome! I'd love to go to the Hemingway Museum and see all those double-pawed cats! The Supreme Cat Show in the UK sounds pretty cool too. I have been to the Ernest Hemingway house. Lots of cats!